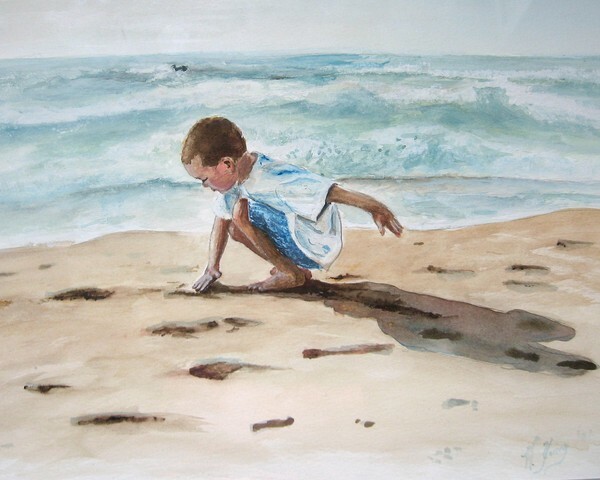 Watercolor by Heather Young, 2007. From photo on 12 by 16 cold press paper. Just beautiful, the only thing I'd do differently, and of course that's my own style, would be to use a little more definition with deeper colors to give the water more weight as overall balance in the composition. Love the pose and your sand is just perfect...could reach out and feel it! Well done piece! Very charming or delightful picture!